While share markets had a great bounce from oversold levels early in the last week they fell back to varying degrees as worries around US interest rates, the US trade conflict with China, tech stocks and Italy’s budget deficit continued along with escalating tensions with Saudi Arabia regarding a missing journalist. This left share markets mixed with Eurozone & Australian shares up, US shares little changed and Japanese & Chinese shares down. Bond yields rose slightly in the US but fell in Germany and Australia. While the oil price and metal prices fell, gold and iron ore rose. Despite a rise in the US dollar the Australian dollar was little changed. Bull markets are characterised by relatively steady gains punctuated by occasional sharp pull backs as investors periodically cut their long positions on the back of adverse news events. Views are that recent falls represent a correction, but of course it remains premature to conclude that we have seen the bottom given the worry list around US interest rates, trade, oil prices, etc. 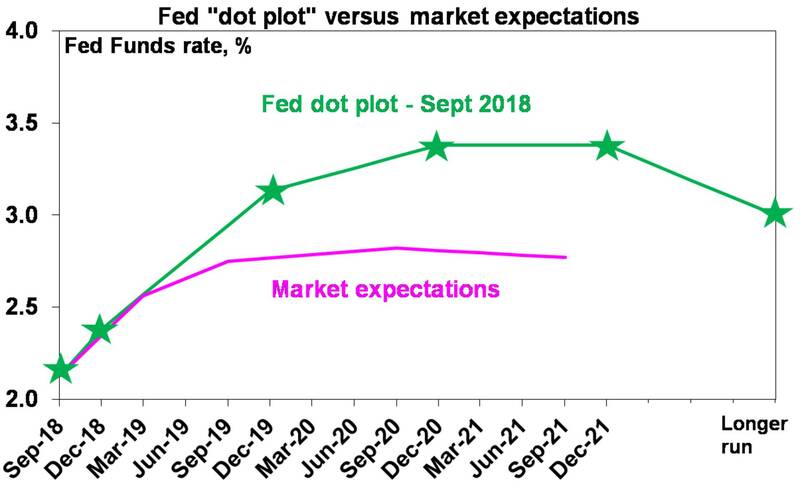 The minutes from the Fed’s last meeting provided a reminder that the median Fed official as per the Fed’s dot plot expects to gradually raise the Fed Funds rate to around 3.4% over the next two years which is just above what it regards as “neutral” (ie around 3%). Market expectations for a hike to 2.8% over two years remain too dovish indicating that bond yields still have more upside, but as we have seen since yields bottomed in 2016 this will likely come in fits and starts. As expected the US Treasury refrained from naming China as manipulating its currency, but this does not mean the trade conflict is about to ease up. Such an outcome was to be expected because the Renminbi does not meet all the US Treasury criteria to be defined as being “manipulated” – yes, China has a large bilateral trade surplus with the US, but its overall current account surplus is small and so too is its foreign exchange intervention. That said the report was critical of China and an “increasing reliance on non-market mechanisms” and so the US may still name it for manipulating next year. So one less thing to worry about for now. But there is still no sign of any resolution on the trade conflict with further escalation still likely. US/Saudi tensions over the murder of a journalist pose a new risk and could easily get a lot worse before it gets better, but ultimately it’s doubtful Trump or Saudi Arabia will sacrifice the US trade relationship with Saudi Arabia (given the threat to oil prices) or that Saudi Arabia will counter-retaliate to the extent that it adversely affects US support for it against Iran. And something completely different – is the “gig economy” just imagined? The term sounds cool and gets bandied around to explain things like low wages growth, but its doubtful it really exists. As the RBA’s Alex Heath pointed out in the last week casual employment (ie workers without sick leave and holiday pay) has been around 20% of the workforce since the 1990s and the share of independent contractors has fallen over the last decade. And in the US the share of self employed in total employment has fallen from 14% to 6% over the last 70 years and workers are in their jobs for longer than 30 yrs ago. So, there is not a lot of evidence of the gig economy. US economic activity data was mostly strong. Housing starts fell as Hurricane Florence impacted but strength in the NAHB home builders’ conditions index points to a rebound. Retail sales were weaker than expected in September but record high job openings and very strong hiring points to ongoing labour market strength which should support consumer spending. Industrial production rose solidly in September and regional manufacturing conditions indexes remained strong in October. And the US leading indicator for September continues to point to strong growth and jobless claims remain ultra-low. Meanwhile, the September quarter profit reporting season is off to a strong start with 87% of results so far exceeding profit expectations and 65% beating on revenue. That said only 75 S&P 500 companies have reported so far. But profits look like they will yet again beat market expectations for a 21% year on year rise and come in around 24%. On the political front in Europe, the details of Italy’s budget plans were not as bad as fearedreducing the risk of a full speed head on with the European Commission and the Christian Social Union’s loss in Bavaria was not as bad as feared taking a bit off pressure off Chancellor Merkel. So, no Euro disaster brewing on either front. UK Brexit uncertainty continues with the Irish border remaining a sticking point. The risk of a no deal Brexit (which would probably knock the UK into recession), a new election or another referendum is significant, but some sort of last-minute deal that punts off details for a future resolution remains the most likely scenario. Its hardly ever that such deals are resolved ahead of when they really need to be! Its too early to get bullish on the British pound though. Chinese economic growth slowed in the September quarter with GDP growth slowing to 6.5% year on year and monthly data coming in mixed with weaker industrial production and credit growth but stronger retail sales and investment and lower unemployment. The slowdown reflects a crackdown on shadow banking and tariff uncertainty. While it’s consistent with forecasts for Chinese growth to slow to 6.5% this year, the trade threat suggests the risks are still on the downside suggesting that further policy stimulus is likely. Meanwhile falling producer price inflation and core consumer price inflation of just 1.7% year on year provide no barrier to further policy stimulus. Another confusing jobs report in Australia – but its mostly strong. The September jobs report was confusing with soft employment growth but continuing strength in full time jobs and a sharp fall in unemployment to 5%. There are good reasons to be a bit sceptical about the plunge in the unemployment rate: sample rotation looks to have played a role and monthly jobs data is known for volatility. That said jobs growth running around 2.3% year on year is still strong, leading jobs indicators are still solid and its hard to deny the downtrend in unemployment. So, the RBA can rightly feel happy that this is going in the right direction. 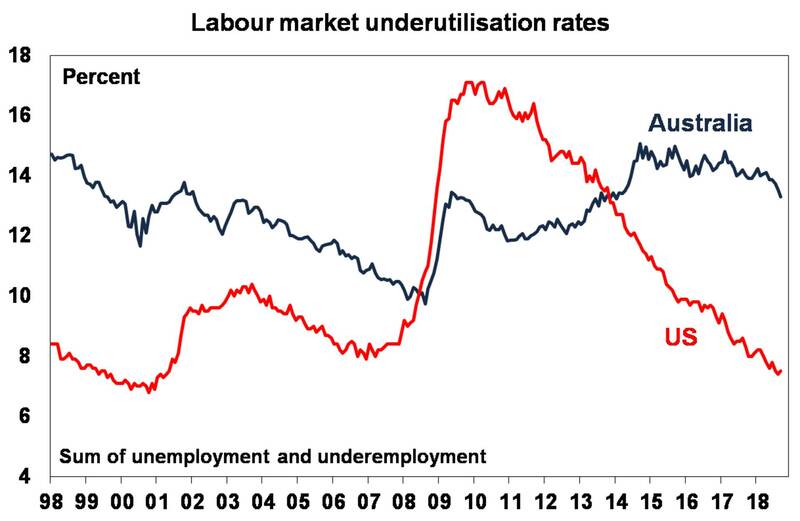 Against this though the US experience has been that unemployment will need to fall a lot further to spark stronger wages growth, and the combination of unemployment and underemployment remains very high in Australia at 13.3% compared to 7.5% in the US. More broadly there seems to be a tussle in Australia between booming infrastructure spending, improving business investment, bottoming mining investment and falling unemployment on the one hand versus falling home prices, peaking housing construction, uncertainty around consumer spending, high underemployment and weak wages growth on the other. The outcome of which is likely to be neither a growth boom nor bust but rather constrained growth and the RBA continuing to leave interest rates on hold out to 2020 at least. In the US, GDP data (Friday) will likely show that economic growth slowed in the September quarter to a 3.2% annual pace from 4.2% in the June quarter. June quarter growth was inflation by a bounce back from the seasonally weak March quarter and Hurricane Florence is also likely to have dampened September quarter growth so underlying growth is probably running around 3.5%. In other data, expect a further increase in home prices but a slight fall in new home sales (both Wednesday), October business conditions PMIs (also due Wednesday) to be solid, underlying durable goods orders to rise but pending home sales to fall (both Thursday). The flow of September quarter earnings reports will also pick up. The European Central Bank is not expected to make any changes to monetary policy at its meeting on Thursday – having already scaled back its quantitative easing program this quarter and looking on track to end it in December. Its expected to leave the impression that interest rate hikes are still some way off probably not until 2020. Meanwhile, business conditions PMIs for October due on Wednesday are likely to have remained solid at around 54. In Australia, it will be a quiet week on the data front, with only skilled vacancy data due Wednesday. There may be more interest on the political front though with the Liberal Partys loss of the Wentworth by-election. However, its should still be able to govern with the help of a conservative cross bencher. We continue to see the trend in shares remaining up as global growth remains solid helping drive good earnings growth and monetary policy remains easy. However, the risk of a further short-term correction is high given the threats around trade, emerging market contagion, ongoing Fed rate hikes and rising bond yields, the Mueller inquiry, the US mid-term elections and Italian budget negotiations. Property price weakness and approaching election uncertainty add to the risks around Australian shares. National capital city residential property prices are expected to slow further with Sydney and Melbourne property prices likely to fall another 15% or so, but Perth and Darwin property prices are at or close to bottoming, and Hobart, Adelaide, Canberra and Brisbane seeing moderate gains. While the $A is now fallen close to targets of $US0.70 it likely still has more downside into the $US0.60s as the gap between the RBA’s cash rate and the US Fed Funds rate pushes further into negative territory as the US economy booms relative to Australia. Being short the $A remains a good hedge against things going wrong in the global economy.